The Crescent Bar Recreation area is mostly considered to be a watersports and golfing spot. However, there is another aspect to it: wildlife viewing. While most of the grounds are carefully groomed and paved, there are still ample natural areas along the expansive sand spit on the Columbia River to provide shelter and food for birds and mammals. You can reach the resort by following the signs off Highway 28 in the Trinidad area. The winding road down the hillside is well paved and wide with even a viewing spot halfway down. The scenery can be quite the distraction! For walking and wildlife viewing, there are several options for parking. The pedestrian/bike path, 2.5 miles one way, is mostly paved other than the last half mile or so at the very tip of the resort. The trail is comfortable even for wheelchairs. If you wish to cover the entire length of the path, park at Teal Park before crossing the bridge at the bottom of the hill. 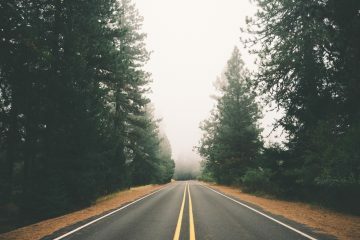 If you wish to walk a shorted distance, drive farther and park by the RV parking area or some of the other day parking sites. The walkway meanders close to the shoreline with pathways to reach the beach areas. There is extensive vegetation in its natural state between the river and the path: this is where the birds and mammals like to spend their time. The mature blackberry bushes provide cover and food for birds and deer. The Nootka roses, reaching the respectable height of eight feet in places, also offer nutrition and hiding places for wildlife. Plenty of upright dead trees in the midst of the lush greenery provide perching spots. 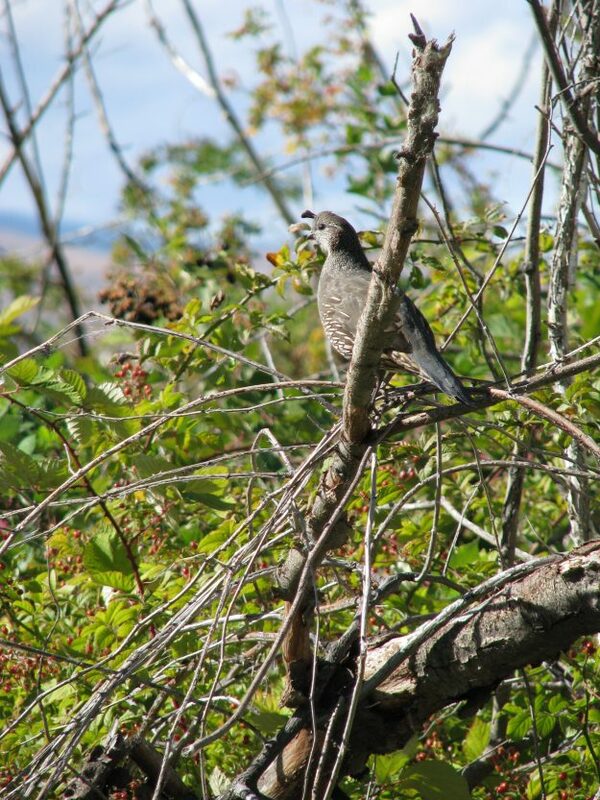 You are likely to see northern flickers, American red Robins and sparrows viewing the territory from these high perches. 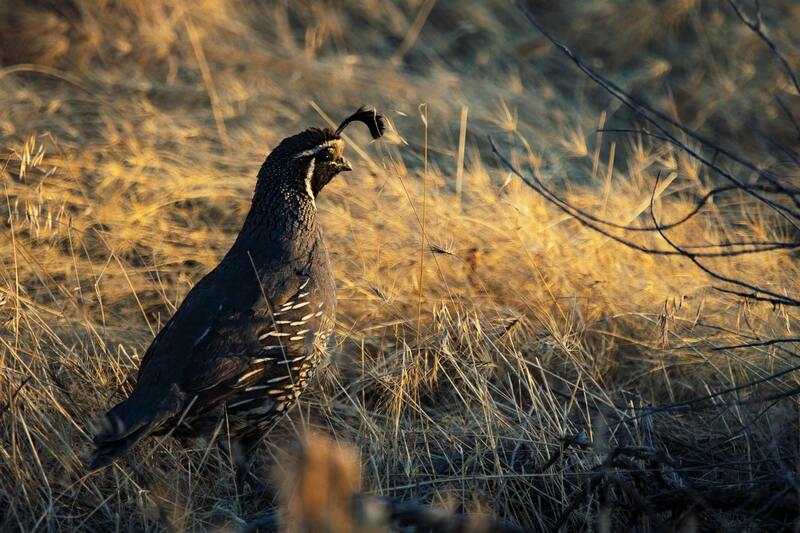 The thick grass and bushes are an invitation for Quail to dwell. The birds scamper about in abundance, occasionally taking flight at the approach of humans. Warblers like to stay in the safety of the brush, as well. Waterfowl naturally enjoy the sand bar, crowding the shorelines and dotting the water. 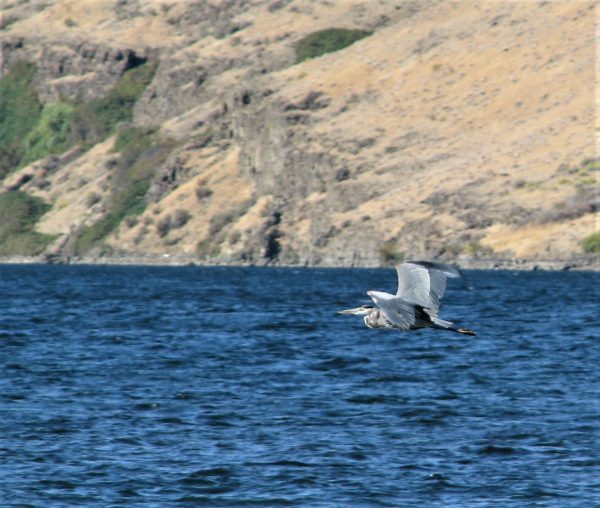 Gulls, ducks and herons are commonplace in the Crescent Bar habitat. You will see the ever-present crows all throughout the recreational area, looking for tidbits leftover from picnics. They also like to settle on the scrags to take inventory of the surroundings. 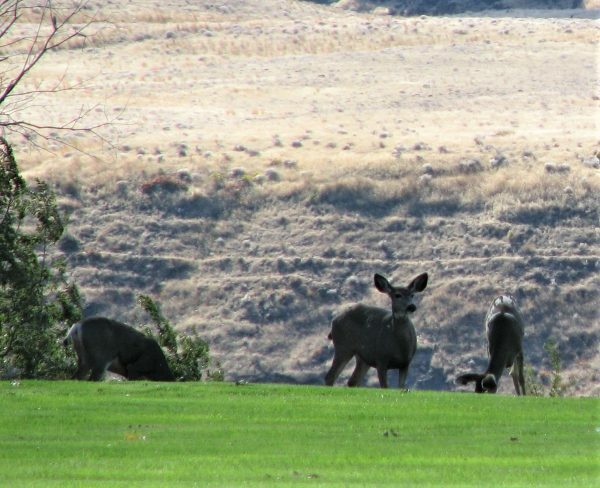 The golf course offers well-tended grass for mule deer to enjoy. They will appear in small groups and peacefully munch on the groomed lawns. The trees around the 8-hole golf course show signs of beaver-visits and have been mostly protected with metal wire along the lower portions. When you reach the very end of the golf course the paved trail turns into a gravel path. 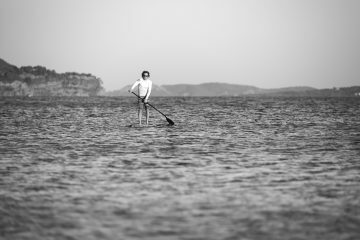 It will lead to the far tip of the land area, offering both open shoreline and lush vegetation for wildlife and humans alike to enjoy. All along the way there are several restrooms and sitting areas should a break be necessary. Length: 2.5 miles one way paved walkway along the Columbia River. .5 miles is gravel. Directions: From Wenatchee head east toward Quincy. Before Quincy near Trinidad follow the signs off Highway 28 for the Crescent Bar Resort. The winding road down the hillside is well paved and wide with even a viewing spot halfway down.